Does this Eee PC offer the best netbook balance yet? The Eee PC 1101 is the latest addition to Asus' Seashell range, which focuses on extreme portability and usability. It is the largest machine in the range, as it boasts an 11.6-inch screen, although it also features an extremely impressive 470-minute battery life. While the panel isn't the brightest we've seen, it is very detailed thanks to the 1366 x 768 pixel resolution. It is LED backlit which provides good colour reproduction, while also proving less demanding on the battery. There is a glossy Super-TFT coating in place, however, so working in changing light can be frustrating, due to the consistent reflections. The 1101 features the best typing experience in the Seashell family thanks to the large keyboard. The keys are a little spongy, but overall we found the action to be intuitive and accurate. The same can be said for the touchpad and mouse buttons, both of which do the job nicely. The chassis the keyboard is mounted in – and indeed the lid – is built from shiny black plastic. While it provides adequate, if not a little lacking, protection for internal components, it looks great, although is a magnet for dust, grime and dirt. As a result, you'll be regularly cleaning this netbook to keep it looking smart. An Intel Atom processor is in place but, instead of the more common N270 model, a Z520 chip is in place. While this features a slower clock speed of 1.33GHz, it is more energy efficient and designed to provide you with an extended battery life. The 160GB hard drive provides plenty of space for work files and folders, alongside photos, music and movie libraries. The portability the machine provides is excellent. The battery will keep you working all day without fear of running out of power, and the 1.3kg that it weighs is hardly a burden to carry around. An impressive range of extras includes a 1.3-megapixel camera for videoconferencing and Bluetooth for wirelessly connecting to compatible devices. The 802.11n Wi-Fi will provide the fastest wireless connections currently available, when in range of hotspots. The three USB ports are useful for connecting peripherals and a VGA-out port allows you to connect to an external analogue monitor or projector in the home or office. 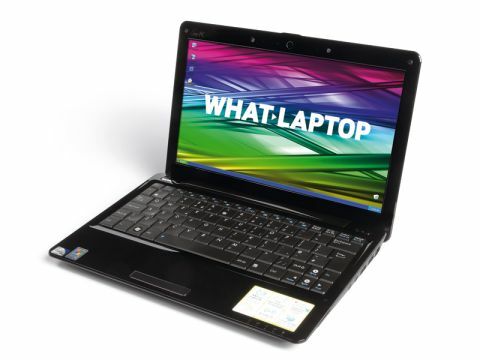 Overall, we like the Eee PC Seashell 1101 a lot. While it doesn't offer the extreme portability of its smaller brother, the 1008HA, it manages to provide a whole host of useful features, while being easier to use and looking fantastic.